T-STORM WTS31-FP – SOS Safety International Inc.
T-STORM WTS31-FP 3% Freeze-Protected AFFF (Aqueous Film-Forming Foam) Concentrate from Williams Fire & Hazard Control combines fluoro- and hydrocarbon-surfactant technolo­gies to provide superior fire and vapor suppression for Class B hydrocarbon fuel fires. 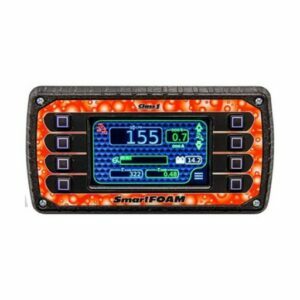 T-STORM WTS31-FP 3% Freeze-Protected AFFF (Aqueous Film-Forming Foam) Concentrate from Williams Fire & Hazard Control combines fluoro- and hydrocarbon-surfactant technolo­gies to provide superior fire and vapor suppression for Class B hydrocarbon fuel fires. 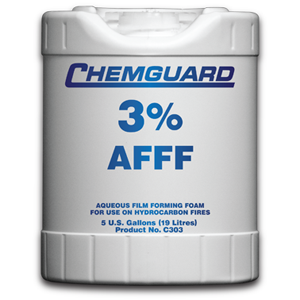 This synthetic foam concentrate is intended for firefighting applications at 3% solution in fresh, salt, or hard water. T-STORM WTS31-FP 3% Freeze-Protected AFFF Concentrate is intended for use on Class B fires: hydrocarbon fuels with low water solubility such as crude oils, gasolines, diesel fuels, and aviation fuels. It is not suitable for use on polar fuels with appreciable water solubility, such as methyl and ethyl alcohol, acetone, and methyl ethyl ketone. The concentrate also has excellent wetting properties that can effectively combat Class A fires. To provide even greater fire protection capability, T-STORM WTS31-FP foam solution may be applied simultaneously with WILLIAMS FIRE & HAZARD CONTROL PKW dry chemical for a twin-agent system. 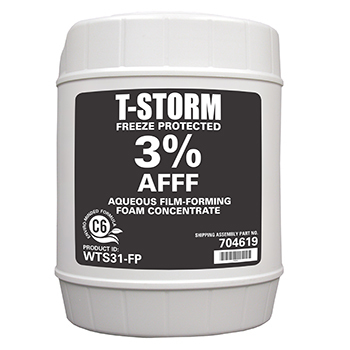 T-STORM WTS31-FP 3% Freeze-Protected AFFF Concentrate may be effectively applied using most conventional foam discharge equipment at a 3% dilution with fresh, salt, or hard water. For optimum performance, water hardness should not exceed 500 ppm expressed as calcium and magnesium. T-STORM WTS31-FP Concentrate requires low energy to foam and the foam solution may be applied with aspirating and nonaspirating discharge devices. Non-aspirating devices, such as handline water fog/stream nozzles or standard sprinkler heads, typically produce expansion ratios from 2:1 to 4:1. Aspirating low-expansion discharge devices typically produce expansion ratios from 3.5:1 to 10:1, depending on the type of device and the flow rate. Medium-expansion discharge devices typically produce expansion ratios from 20:1 to 60:1. For delayed use: Consult Technical Services for guidance regarding suitability of a stored pre-mix solution (fresh wateronly). 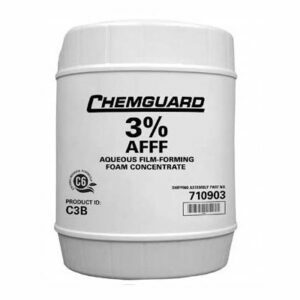 T-STORM WTS31-FP 3% Freeze-Protected AFFF Concentrate is available in pails, drums, totes, or bulk shipment.